The National Business Aviation Association (NBAA) provides certification of aviation professionals through its Certified Aviation Manager program. The certification process includes an in-depth qualification procedure which considers the applicant’s experience level in managerial positions as well as higher level education in aviation specialties. The applicant’s experience and education is reviewed by a panel of Certified Aviation Managers who determine if the applicant meets the experience level required to participate in the program. Accepted applicants then prepare to sit for the rigorous examination process. Applicants prepare for the examination by participating in courses designed for the program on topics as diverse as tax and regulatory compliance, maintenance management and airport leaseholds. Other preparation methods include studying the exhaustive resources provided by NBAA, and participating in study groups hosted by current qualified Certified Aviation Managers. Typically a Certified Aviation Manager applicant will spend over a year in preparation to sit for the exam. 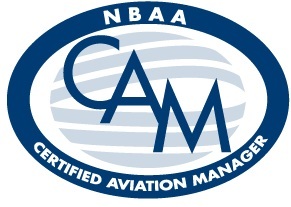 The CAM designation is highly sought-after by employers in the aviation industry as it reflects the highest level of aviation managerial accomplishment possible. Many companies will allow only CAMs in positions of leadership and involved in management of aircraft and other aviation assets. CAMs will typically hold the highest managerial roles such as Flight Department Manager, Director of Flight Operations, Director of Maintenance or Chief Pilot at the most prestigious flight departments. At Desert Jet, only Certified Aviation Managers are permitted to manage clients’ aircraft. With several CAMs on staff, Desert Jet has the most experienced managers in the country available to manage your multimillion dollar asset. Be sure your aircraft is being managed by the most experienced professional available – the Certified Aviation Manager. You can reference a list of all current Certified Aviation Managers on the National Business Aviation Association’s website at http://www.nbaa.org/prodev/cam/roster/.